Drawing in US earnings, the earnings beat rate so far has been around 60%, fairly average historically, whilst the revenue beat rate has been around 48% which is some way lower than the average of around 60%. This continues to reveal that companies have maintained earnings rather by cutting costs rather than genuine growth, which in turn reflects the economic weakness that we have been experiencing. So the key question remains whether we are now to see a turn up in growth. I maintain that we will, due to lower commodities prices in H1 2012, due to a natural upswing in growth, and due to a new round of global easing and stimulus currently occurring. That brings us to the Federal Reserve meeting outputs of tomorrow and the ECB meeting on Thursday. What should we expect in terms of further action? I suspect the Fed will reiterate its commitment to act without actually acting, but go with more dovish wording, whereas I suspect the ECB will deliver something tangible. Since Draghi propelled the markets last week with his ‘do whatever it takes’ wording, the markets are expecting something concrete. If we get nothing on Thursday, those gains may be retraced. Thursday is the full moon, and we would normally decline into a full moon. There is still the possibility of big declines the last 2 days into and on it, if the Fed and ECB disappoint, however it rather looks like we will make an inversion. In addition, the oversold and overbearish readings for both the Euro and precious metals also provide fuel for a pro-risk rally and dollar retreat. 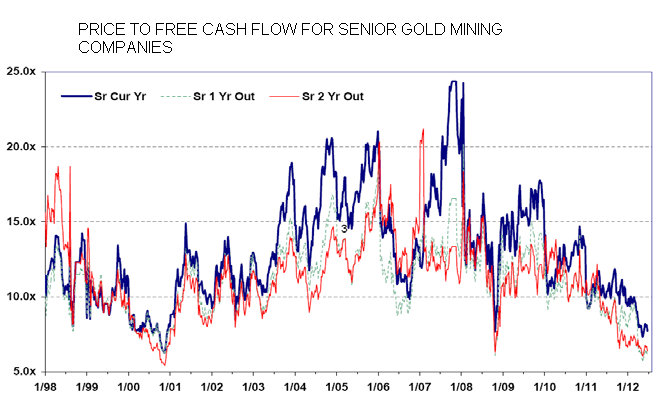 Chris Puplava’s chart here shows that open interest and real interest rates both support an upward move for gold, with the US dollar apparently holding it back. A mean reversion in Euro-dollar therefore could sustain a rally in gold, which would be technically very important as it would mark an upside resolution out of its 9 month triangle. 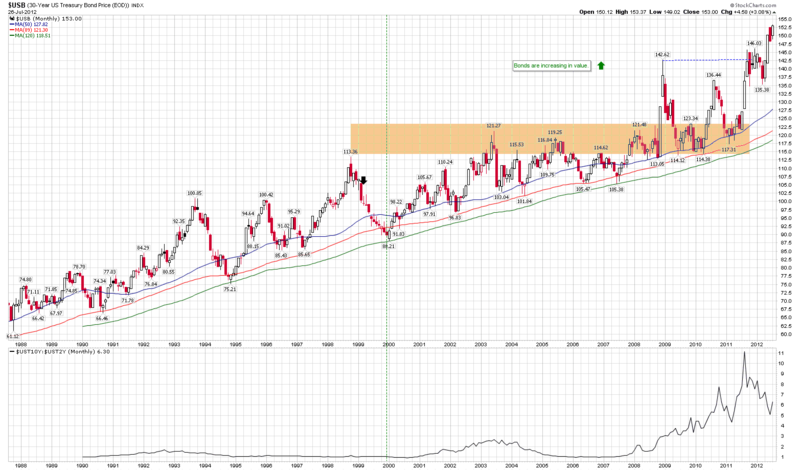 Agri commodities have consolidated a little, having reached overbought levels. Fundamentals are still currently supportive with more normal weather conditions perhaps returning as of September, which keeps harvest fears at the forefront for now. 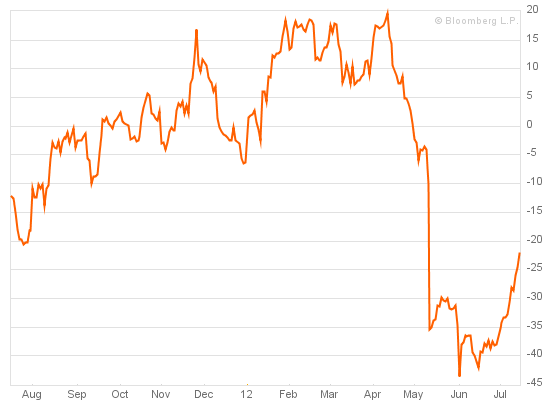 Treasuries made a large reversal on Friday from all-time highs. It is too early to judge whether that marked a significant top. On the one hand, the overbought and overbullish parabolic recent move is ripe for an enduring reversal, but on the other hand the Fed is still a supportive player in that market. OK, bringing it all together, the question on my mind is whether I want to take some pro-risk profits off the table here into the FOMC and ECB. For anyone new to my site, my portolio of positions is currently 100% pro-risk, with the biggest weighting long commodities (precious metals, agri, energy) then long equities (various global stock indices), then short treasuries in a much smaller weighting. 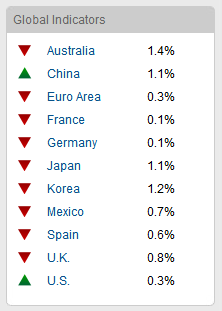 I currently have no currencies positions. Drawing together the secular and the solar I anticipate a pro-risk rally in H2 2012 through to the solar maximum of 2013, but with equities wilting before we reach the solar maximum whilst commodities make their final blow-off secular top. 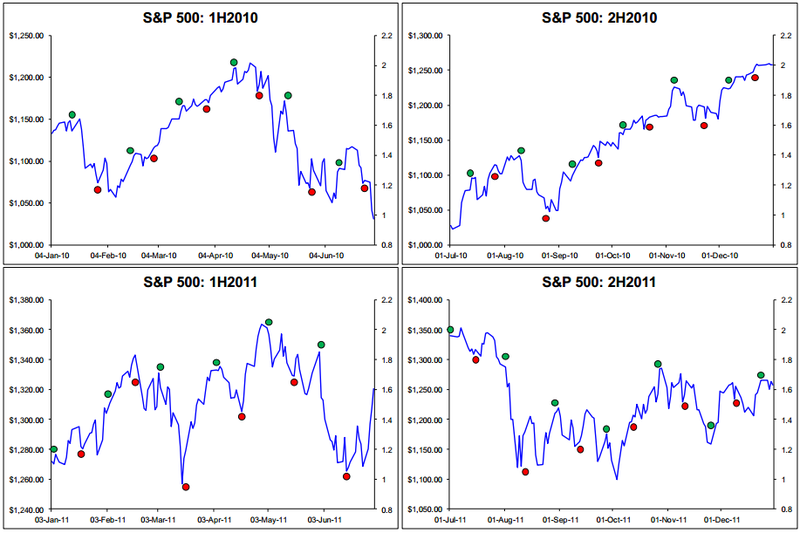 Equities could therefore top out before the end of 2012 but not before they’ve had a pop to new highs. Right now the picture looks more supportive of that general scenario that I have been promoting for some time. Economic surprises now look supportive, Euro debt is showing signs of coming off the boil again and US earnings are good enough. Leading indicators remain the area of concern, but if I am right in my reasoning for why they should begin to improve then I believe that provides the final piece of support for a move to new highs in pro-risk. 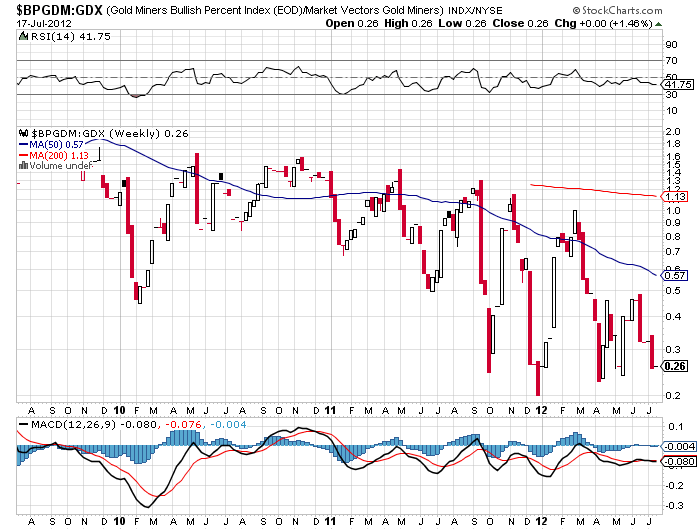 Chinese leading indicators in particular are important for commodities. However, soft commodities have had a thrust due to global wierding and precious metals have the support of reinforced negative interest rates from the latest central bank interventions. Precious metals enter their seasonally strong period of the year as of August, with Indian wedding demand one factor, and global wierding remains supportive for soft commodity prices for the near future. By solar cycles, inflation should peak around the solar maximum, and the price rises in softs that began in June should feed through into in inflation 6 months later. If they can further their rises and oil was to also rise on H2 growth (or supply issues) then we could indeed see that acceleration in inflation into Spring 2013. So right now I am going to maintain all my positions and not take any profits. However, if pro-risk pushes up significantly more today and tomorrow before the FOMC outputs then I may trim back. I will let you know in the comments if so. This is the technical picture for the Nasdaq, the leading index. 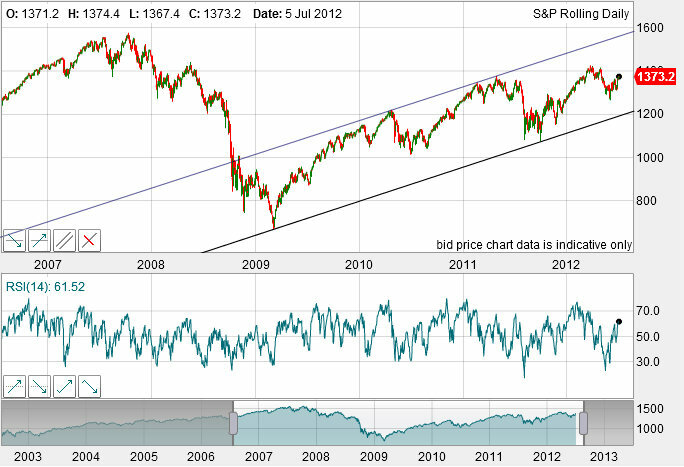 In a very tidy channel since the bull market began in 2009, it has made a series of advances and consolidations. 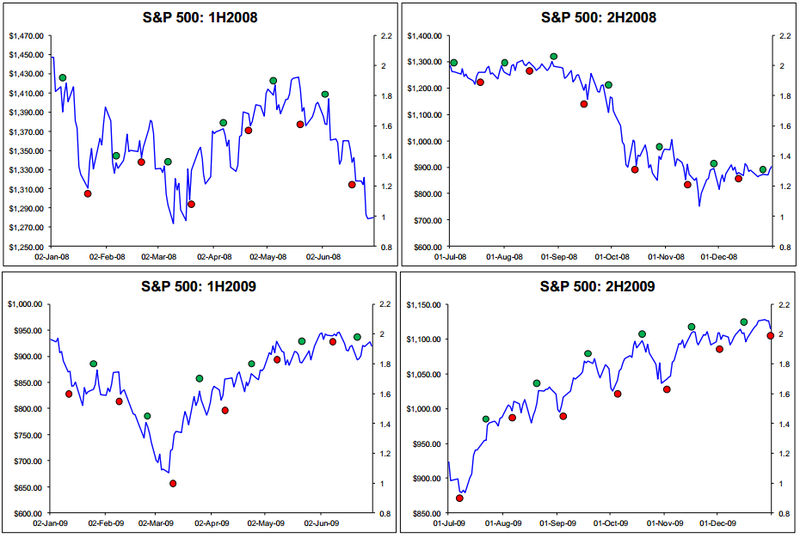 I have marked the horizontal supports for the consolidations – in each instance the market retreated to the previous bull market high and successfully backtested it without dropping below it. 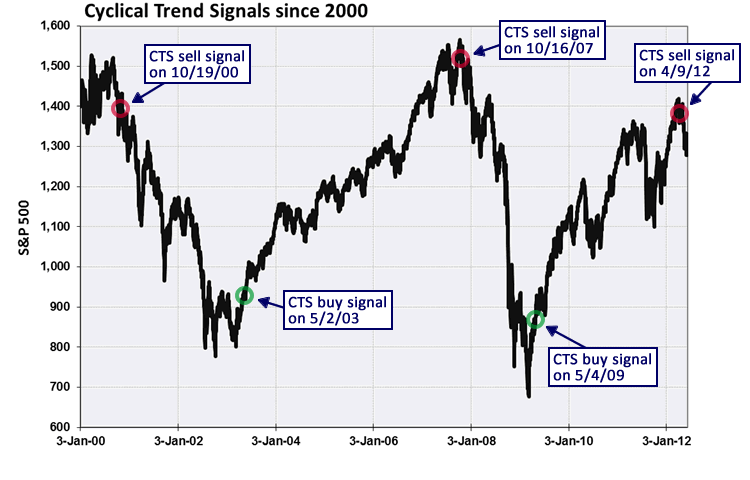 This has happened again in 2012, with the market holding above the 2011 highs. In short, the bull market is very much in tact from a technical perspective. The Nasdaq is currently at the bottom of its bollinger bands, suggestive of an up-move ahead, however there is scope for the overall consolidation to be extended deeper into 2012 without compromising either channel or horizontal support. Barry Bannister send me his latest macro deck and I pick out this one chart below which shows his expectations for where stocks are headed. He forecasts reflation for H2 2012, like myself, to push up stocks. He quotes four phases to a cyclical stocks bull in a secular bear, and accordingly anticipates a kind of overthrow move to complete this cyclical bull (similar analysis and forecast to Laslo Birinyi). 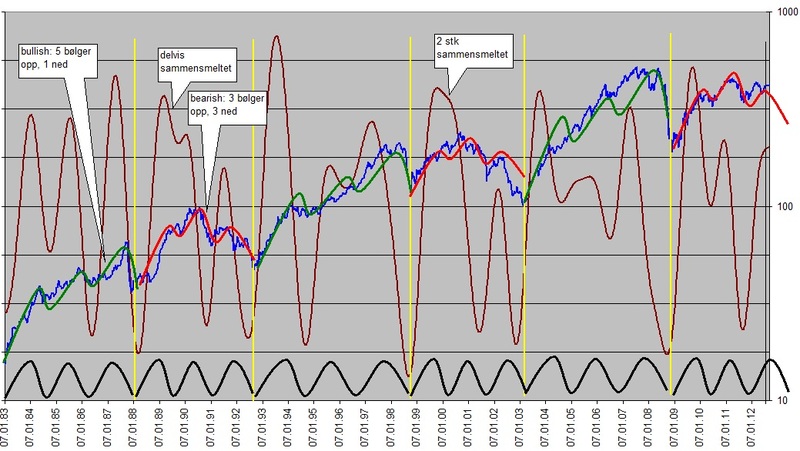 Now I’m going to contrast the above with Jan’s charts that show the key cycles on the Norwegian index. What both show is a decline into 2013. He expects the decline in equities to begin now or at the very latest October. Eurodollar COT one year advanced suggests a rally in equities into the US elections. 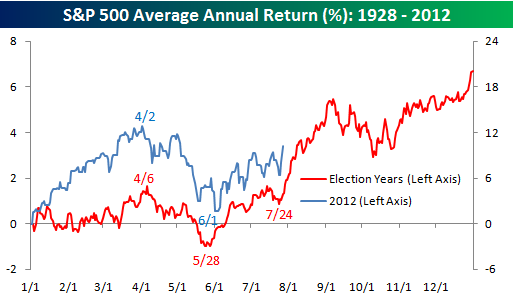 Presidential cycles also predict a rally from here into November. The next major Bradley turn is 28th July, and after that 22nd December. I concur with those commenters that Bradley turns can be highs or lows and the siderograph is just a ‘best guess’ for which are likely to be which. Geomagnetism, by seasonality, becomes more intense in September and October, before lessening into year end, whilst sunspots should continue their waving up towards the solar peak, still forecast to be Spring 2013. So the question is, can we unite all the above? The best fit is that stocks bottom out as we turn into August, and then rally into year end (Eurodollar, presidential, Bradley turns, sunspots, Bannister, Birinyi). The alternative is that stocks top out as we turn into August and fall into the US elections (Jan’s cycles, geomagnetism, Bradley siderograph). 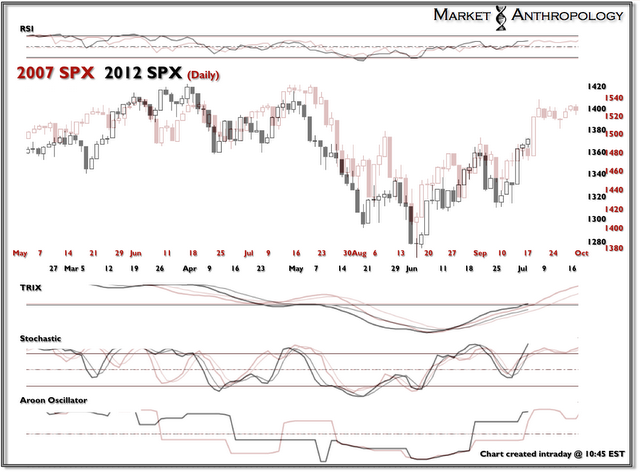 By Jan’s cycles we would in fact keep falling into mid 2013. As previously noted, I believe that we will see a pick up in leading indicators in the weeks ahead, which will inspire the best fit to come good. As I expect stocks to top out before the solar peak (and associated secular commodities peak) it is still possible that they then fall into mid-2013 in line with Jan’s cycles. Let’s see if equities rally or fall out of this next week’s Bradley and FOMC. By my shorter term models, we should fall into the FOMC, and then bottom out to rally. 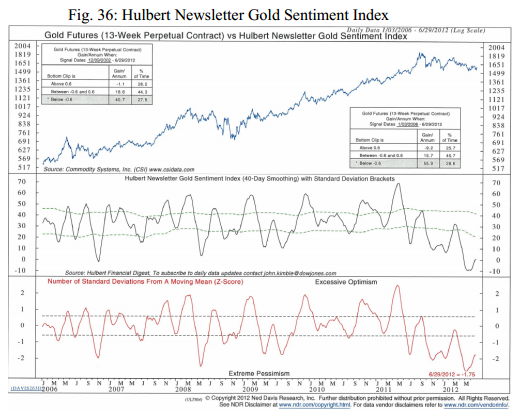 The chance of an upward resolution is supported by extreme bearishness in gold, with the Hulbert gold sentiment index averaging -3.3 over the last 4 months which has not occurred since 1991. 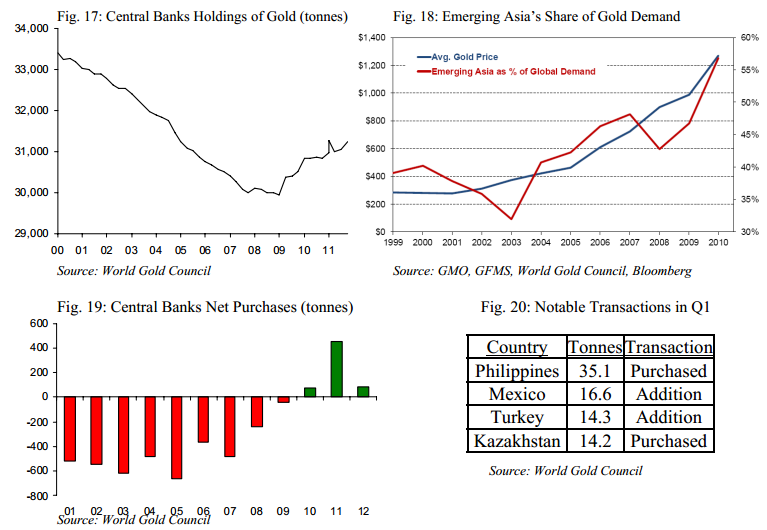 Global central banks continue to be net purchasers of gold, with significant additions in H1 2012. Plus, the current round of further global rate cuts is ensuring negative real interest rates are maintained, which keeps the allure of gold for diversification. 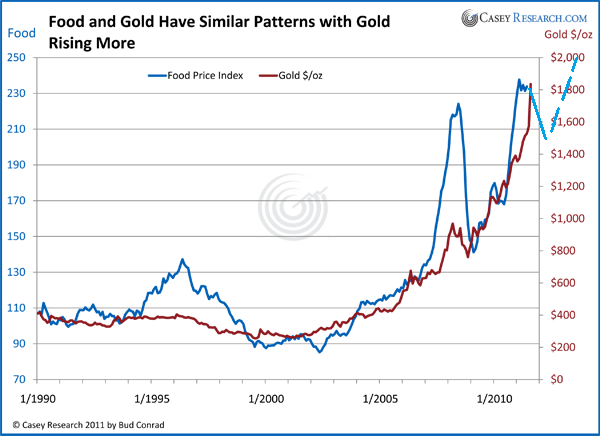 I reproduce below Casey’s chart showing the close relationship between food prices and gold. Since this chart was published, gold has made its 9 month triangle with a base at $1550, whilst food prices pulled back to 200 – again a similar move for the two. But based on the acceleration in soft commodity prices in the last few weeks, the food price index is predicted to make new highs in H2 2012, which should imply gold also makes new highs. 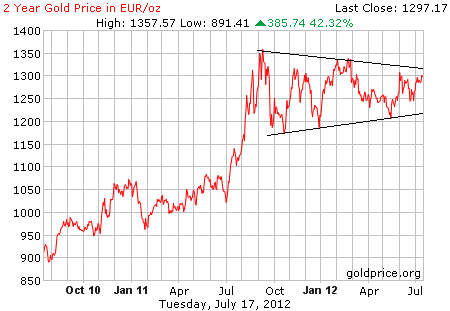 I am long gold, and I am presenting reasons for an upward breakout. So let me balance that by highlighting reasons why gold could break down. 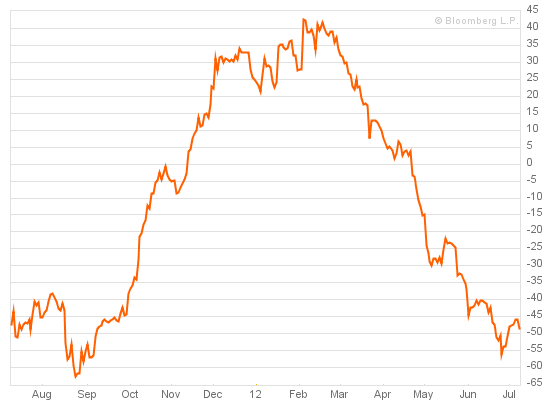 One is continued dollar strength and continued Euro weakness. 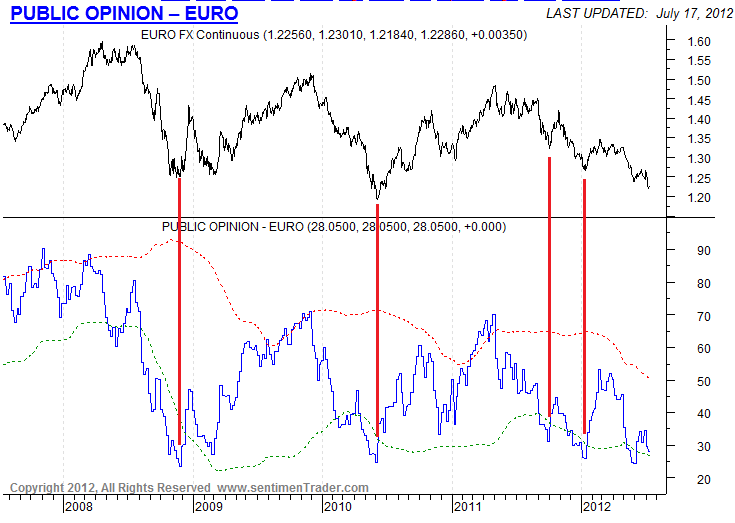 However, the Dollar-Euro bullish trade is currently overcrowded. 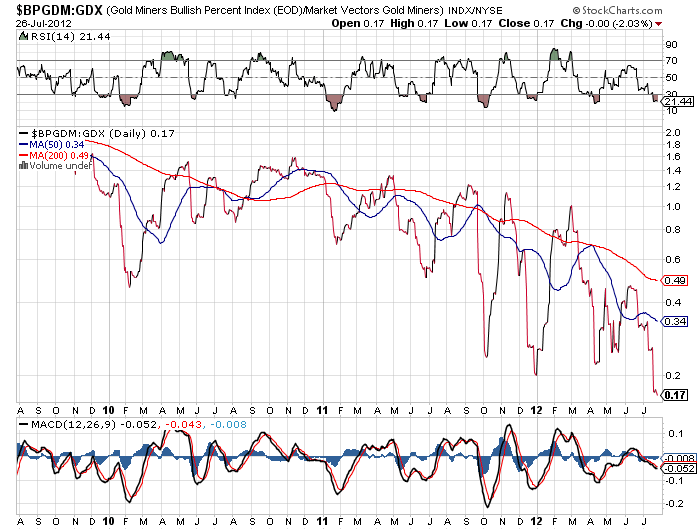 Extreme bearishness in the Euro, like the bearishness in gold, makes it more likely a mean reversion will occur. Two is a big deflationary episode. 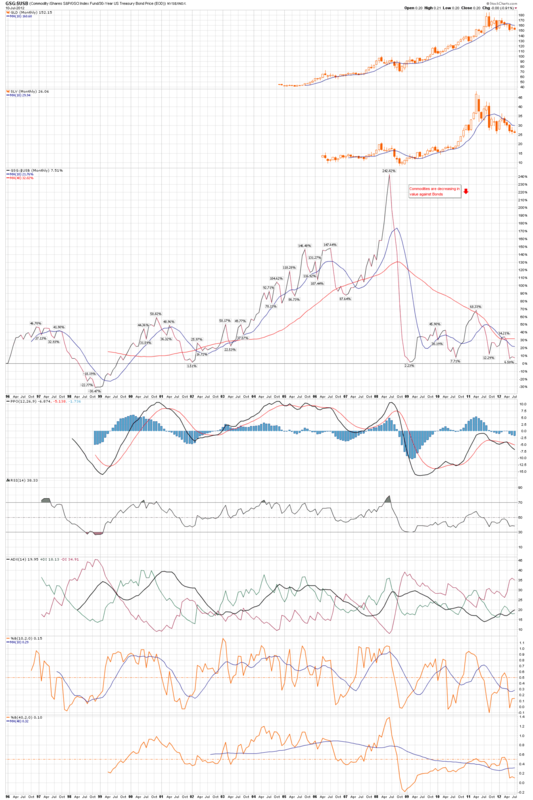 If leading indicators continue to fall or sovereign debt issues escalate to new accuteness or China’s slowdown morphs into a hard landing then we would likely see no asset escape from the sell-off, as in 2008 when gold was sold off to raise cash against other greater loss making trades. However, the technicals above reveal that gold and gold miners have already experienced a washout similar to 2008 over the past 9 months. Thirdly, if gold already made its secular peak in 2011 then bearishness in gold and miners is likely to be the new norm, with just relief rallies inbetween. In that instance, gold would make a decisive breakdown from the large triangle, followed by a series of lower highs and lower lows. 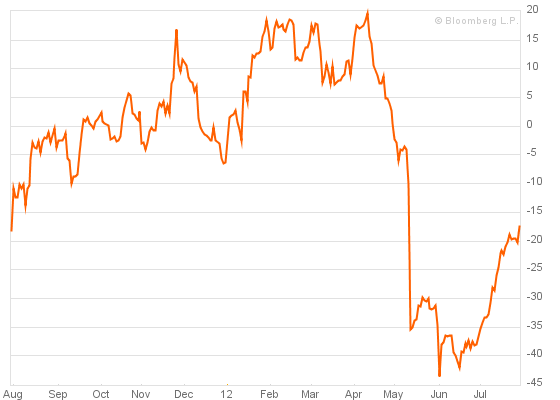 For gold to lose its luster in that way, other assets would have to become relatively more desirable. Real estate is showing signs of rebirth in the West, so that’s one possibility. European stocks are largely in single p/e valuations, which is a second possibility. If money were to pour into real estate and equities then that would imply the Kondratieff Winter was over the the Spring had arrived. 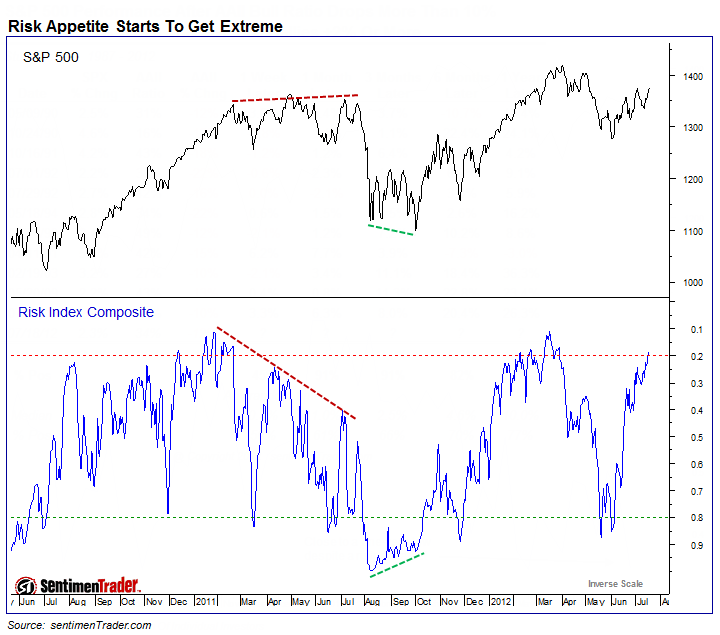 New secular bulls in equities and real estate would be underway. 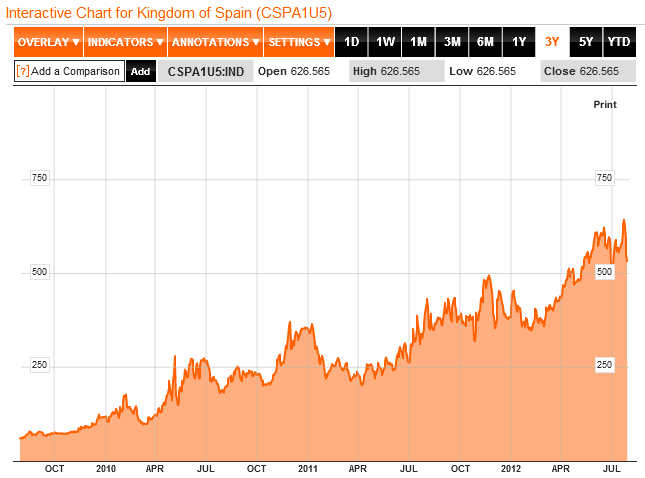 Ultimately I can’t buy the idea that gold topped in 2011 for these reasons. One, secular asset bulls typically end in a parabolic blow off and then steep fall. Gold has instead coiled near its highs. Two, we haven’t yet reached the previous secular extremes in gold:stocks and gold:realestate ratios. Gold is relatively expensive to both, but not extreme. Three, gold demand versus supply is not projected to invert until 2014. Four, by solar cycles, gold should peak shortly after the solar maximum, which is forecast for Spring 2013. Five, by secular cycles, we should see a second and higher inflation peak 5 years after the last (2008), i.e. 2013. 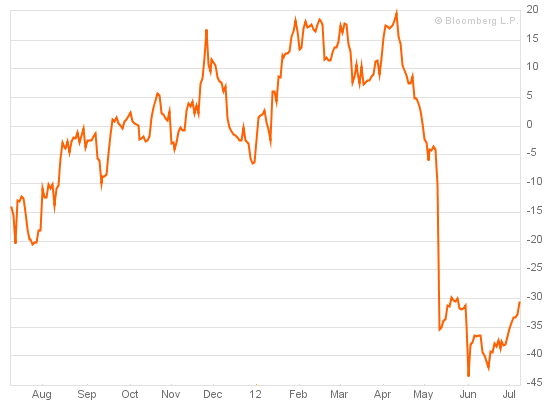 Bernanke’s testimony yesterday decreased the likelihood of QE3. Whilst that may be a short term disappointment for gold, it doesn’t need it, due to global maintenance of negative real interest rates. 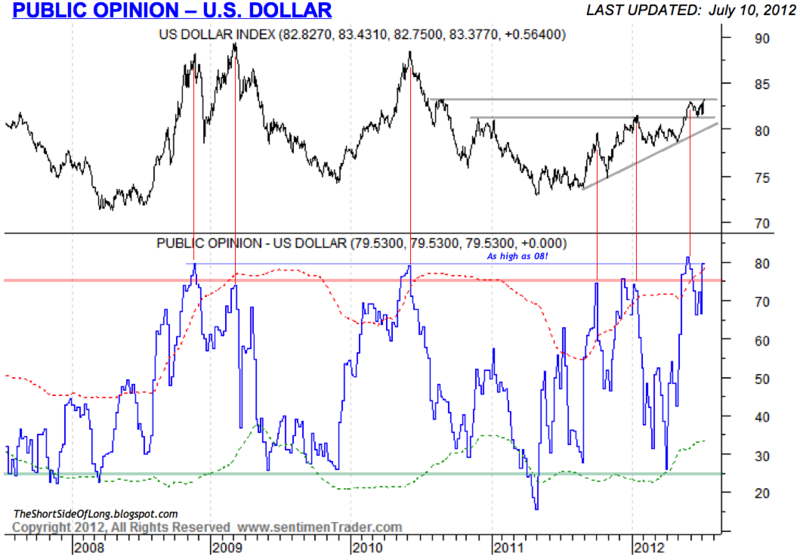 Nevertheless, gold remains devoid of momentum and languishing bearish. What will trigger the triangle break? If nothing else, time is close to running out. The message is one of improvement in actual data versus expectations. The message is one of continued negativity. ECRI US leading indicators made an uptick on Friday but one week doesn’t make a trend, and it came on the heels of another ECRI media appearance reaffirming their call that the US is in recession. Scott Grannis made a compelling case in response as to why the US isn’t in recession here. There has been general improvement since the Euro summit outputs, in that French, Spanish and Italian CDSs have all fallen back the last 4 weeks. 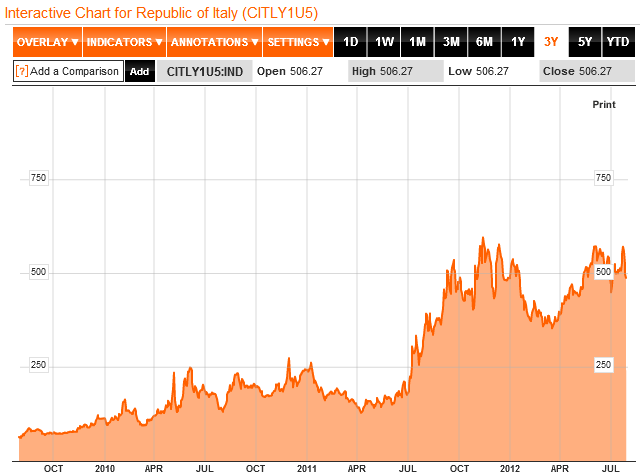 Only Greek CDSs are notably rising again. Now let’s turn to geomagnetism and sunspots. All models have been updated this morning. There was a big geomagnetic storm the last 2 days (circled on the chart below) and there is another siginificant episode predicted all the way through from the 27th July to the 4th August. This is higher geomagnetism than is seasonally expected, and the result is that my short and medium term models continue to trend downwards. There is neutral pressure into this Thursday’s new moon but thereafter downward pressure erupts. On the flip side, sunspots continue their general trend upwards which is a positive. Next, US earnings. Goldman report today and we will see other big names this week. Only one third of companies have beaten estimates so far, but we need to see the bigger volume of reports this week to get a better feel of the beat rate. So far though, earnings are a negative. Turning to central bank intervention, Bernanke is scheduled to speak today and the markets are again looking for clues as to whether more stimulus is likely. August 1 is the next FOMC outputs. Otherwise, central banks around the world continue a theme of more easing and stimulus, but there is a new threat to this in that soft commodities have been sharply acccelerating, particularly grains. 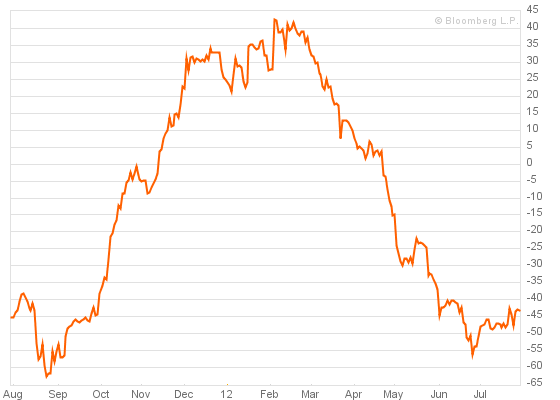 In emerging markets especially, this is likely to translate into inflation in H2 2012, which may impede further easing. So let’s finally turn to agri commodities. 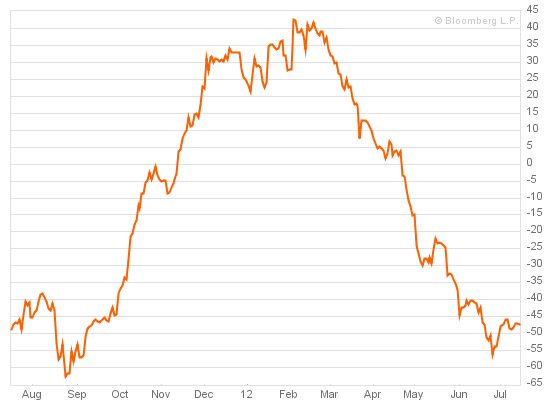 Soft commodities, particularly grains, have been experiencing a supply-side push due to global wierding. The global climate report for June is in and it was the hottest global June on land on record, as shown below. This follows the hottest May on land on record and the second hottest April on land on record. In July so far, the heat and drought extremes persist. El Nino should develop as the summer progresses which could ease these issues, but El Nino also brings it own problems. 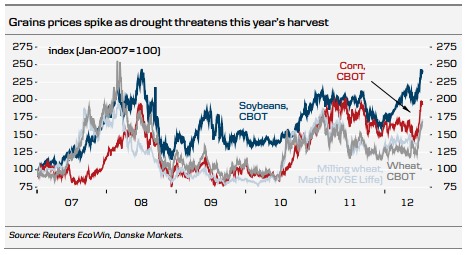 For now, grains are surging in price and are threatening their previous two major highs of 2008 and 2010/11. 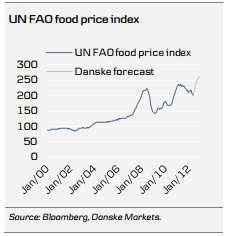 Danske predicts that the UN food price index will accordingly shoot up in H2 2012 to a new high. If that occurs, it will be highly significant in support of a secular commodities peak ahead rather than already occurred in 2011. So let me summarise. 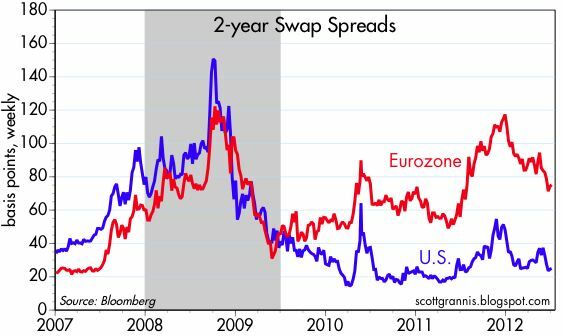 Economic surprises and Euro debt both appear to be turning in favour of pro-risk. Meanwhile, leading indicators continue to point red, but global policy responses also continue, with the likelihood that at some point leading indicators will improve as a result. However, recent soft commodity price rises may be about to close the window on easing. US earnings gather pace this week and by Friday we should have a better feel for whether they are likely to be a drag on the markets over the next few weeks. Geomagnetism is currently higher than is seasonal, and should be a downward pull on pro-risk after the end of this week. Sunspots, however, continue to rise in an overall trend, and should encourage speculation into commodities. Trading-wise, I am leaning towards a little more upside in pro-risk into this Thursday’s new moon, due to the technical picture on most charts. Should that occur, I will take some profits off the table. The FOMC is an unknown, however Bernanke could telegraph his intentions as early as today. If he sticks with no further action then the markets may protest again. I have focussed on the macro today, but technical indicators continue to show excess bullishness in treasuries and dollar and excess bearishness in the Euro (plus a positive divergence) and excess bearishness in precious metals. What this means is that a move the other way is ripe, subject to supportive developments. In other words, some evidence of improvement in leading indicators, some dovish noises from Bernanke or some big US earnings beats could all set the scene for a more enduring pro-risk rally. Without improvement in these three areas, the danger is the current pro-risk rally tops out again. Here is the 30 year treasury long term chart. Price has hit the top of the channel from which previous reversals occurred. Below we see the commodities to 30 year treasury bond ratio which is back to the level at which historically commodities have been bought versus bonds. 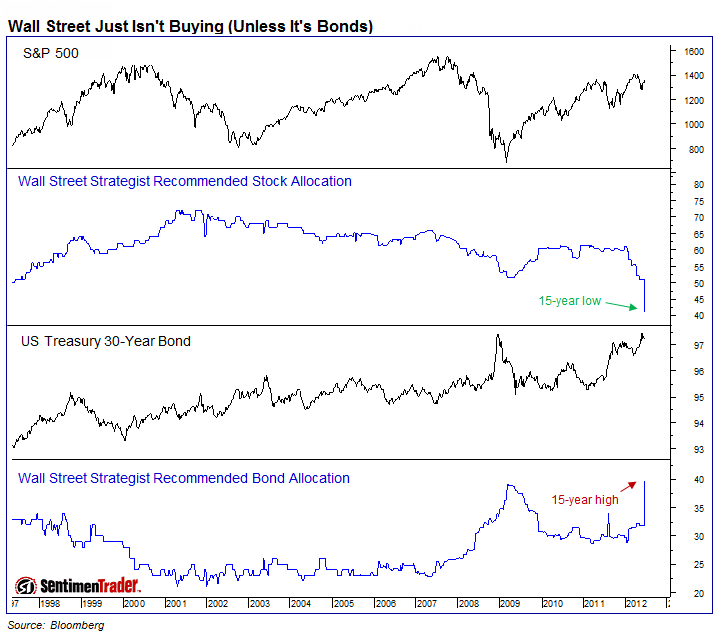 Next we see that Wall Street strategists’ recommended allocation to bonds is at a 15 year high and to equities at a 15 year low. The steep drop in recommended stock allocation not only exceeds the 2008/9 panic low but also resembles a capitulation. Below are the global p/e ratios as at the end of June. Those in single digits are at secular bottom valuations. 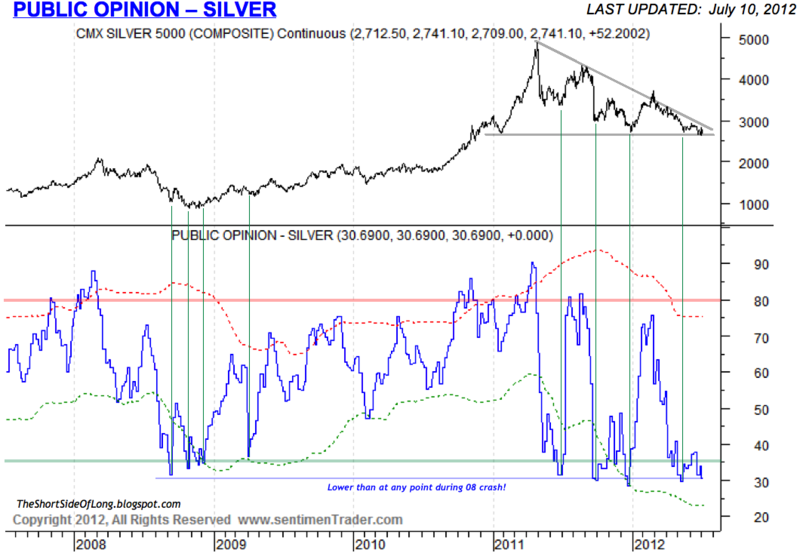 Next, two charts courtsey of Tiho, which show that public opinion is at opposite extremes for silver and the US dollar, both at comparable levels to the 2008/9 panic lows. 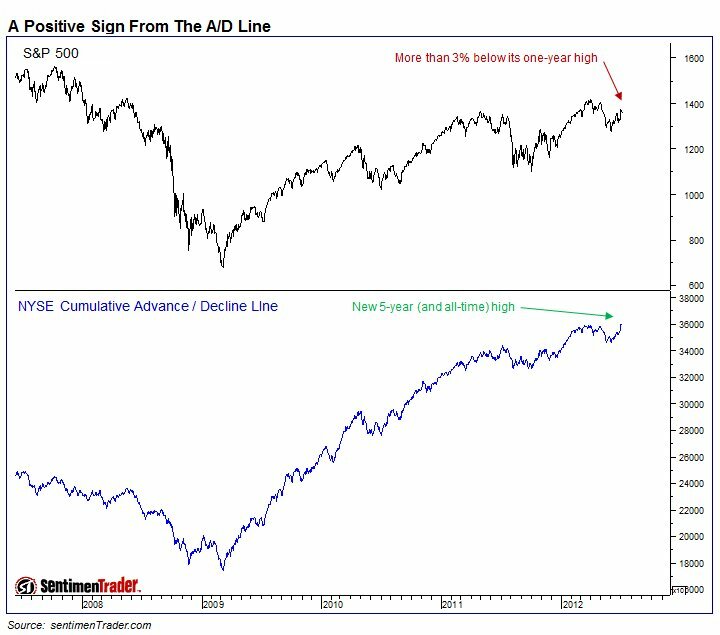 And lastly, a chart showing there is internal strength to the recent up move in stocks, with cumulative advance/declines at a new high, that normally suggests new market highs ahead. Drawing all together, the bigger picture suggests that an enduring move should be at hand away from treasury bonds and the US dollar towards commodities and stocks (particularly European), in other words a major rally in pro-risk and out of safe havens. The message is one of a potential bottoming in June, but we need to see a clearer uptrend emerge for the G10. 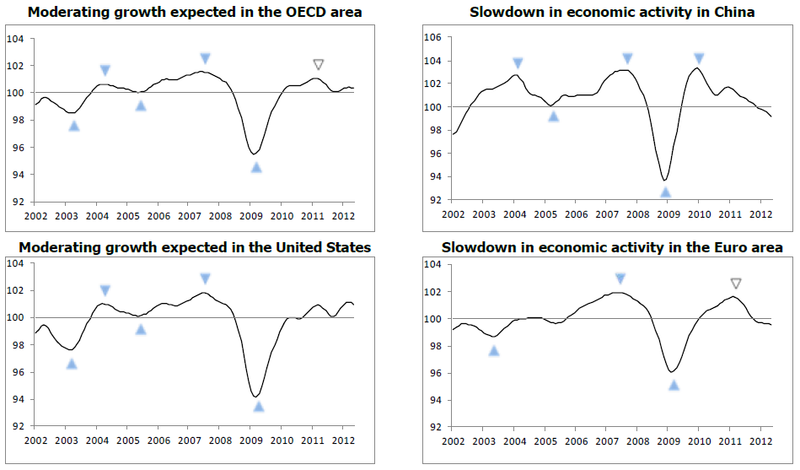 Turning to leading indicators, the latest OECD data continues to show a weak picture in China and Europe, but the overall OECD nations area maintaining growth, albeit unimpressive. 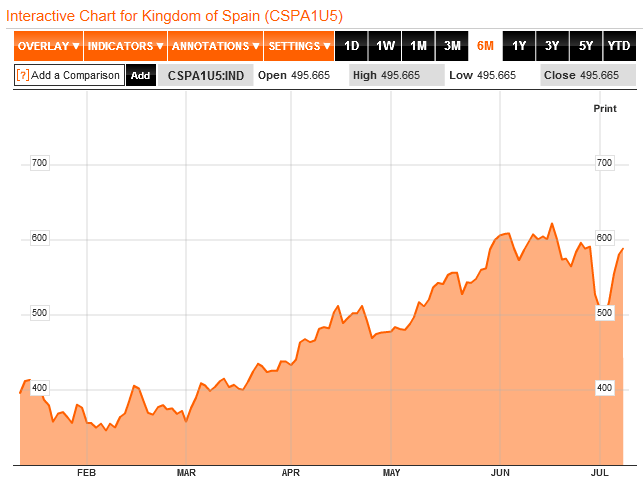 Moving on to the Eurozone debt troubles, the pressure deflation in Spanish CDSs following the Eurozone summit outputs of the end of June has now been reversed and CDSs are back near to their highs. 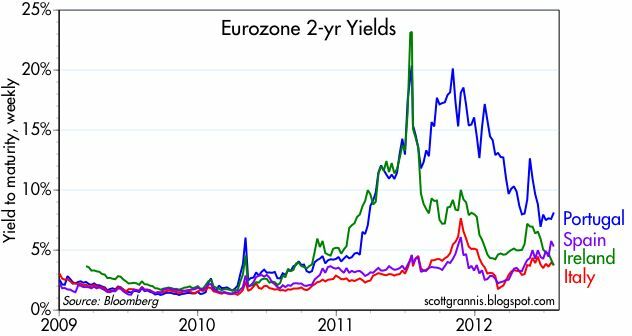 The message is that more action is going to required to satisfy the markets on Euro debt but that with Spain, Italy and Greece equities priced at secular bottoms, they are prices for systemic failure which isn’t likely. Overall in terms of the big 3 (economic surprises, leading indicators and Euro debt), we don’t yet see the kind of positive combined momentum that would support a big move up in pro-risk. However, the global policy response, in terms of rate cuts and stimuli, has yet to make itself fully felt and is unlikely complete. 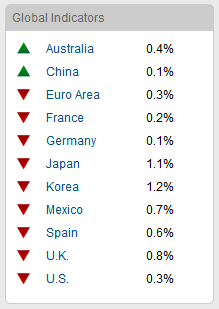 Last week we saw fresh UK QE, China, Euroland and Denmark rate cuts added to previous global moves. August 1st is the next FOMC outputs, where we will see whether the US adds any further stimulus. So the question, I believe, is how pro-risk performs in this window where we see continued macro weakness but continued new global policy responses. One other macro development is that of global wierding on agri commodities, which gives us a supply side push on prices, regardless of economic outlook. Record global temperatures in April and May have brought about droughts that have spurred grains to an almost 30% gain in the last month and have by association pushed up all softs. Now, agri commodities are looking overbought and due a rest. The severe weather continues but El Nino is expected to make a full return this summer which should improve conditions for drought-affected farming. It is therefore a question of how great the impact is on plantings and harvests before less extreme conditions return. There is the potential within that for a little upside into the end of next week, the 20th July, around the new moon, before we experience a bearish combination of a significant period of geomagnetism and a full moon around the turn of the month into August – which coincides with the FOMC. Disappointment out of the FOMC is the potential therefore. Lastly, US earnings season began yesterday with Alcoa. JP Morgan report on Friday but the major earnings don’t really get going until next week. There’s usually a theme to US earnings season (it is sold off, or bought up). The out of season earnings and significant forecasts downgrades both suggest it could be a season offering a good beat rate, which could therefore be bullish for stocks. However, we will need to wait to next week at least to see if that is the case. Market Anthropology show this technical analogy with 2007 (below). What happened next? The beginning of the waterfall declines all the way down to March 2009. I don’t believe that’s where we are now, but the technical similarities are not in doubt. Analogies can work – e.g. the Mammis sentiment analogy played out in H2 2011 very well. 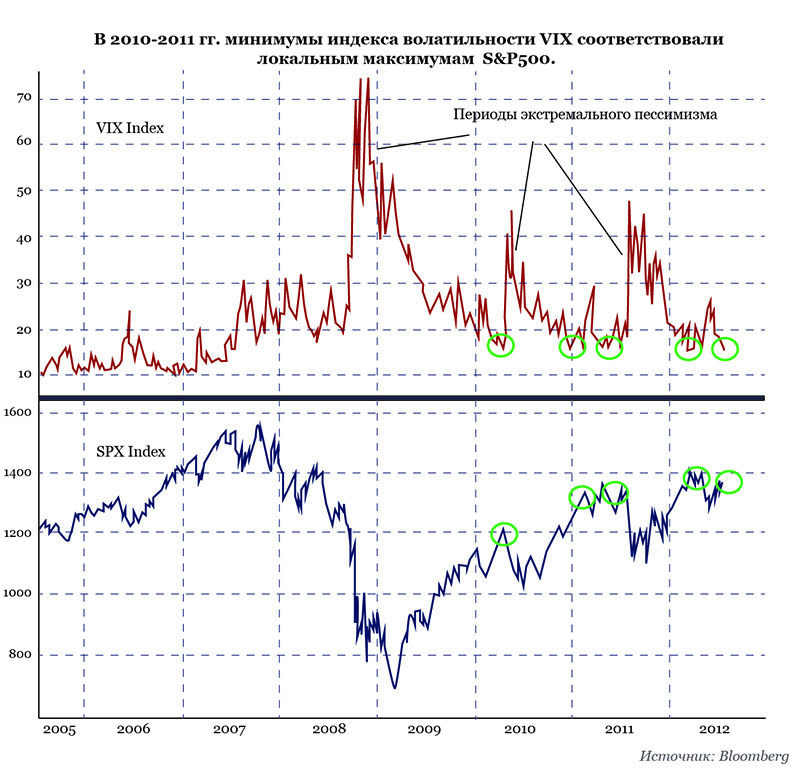 Yet, 2011’s mid-year correction provided a similar close analogy with 2007’s top and subsequent action, which various analysts noted at the time, but eventually failed as the market rallied out of it late in 2011. But if the analogy below is to play out a little further, then we might look to 1400 as a potential target for the Sp500. Prometheus show a (proprietary) cyclical bull market top signal took place at the top at the start of April this year. 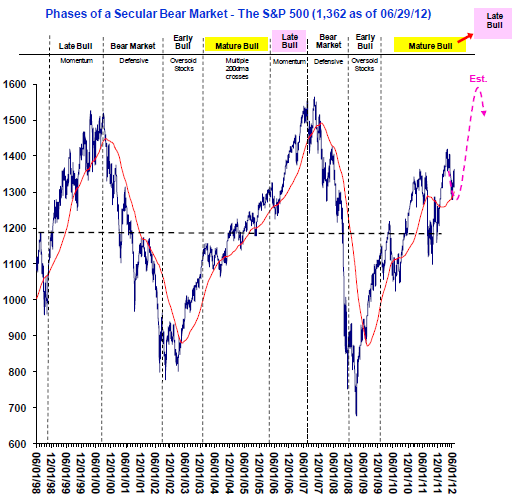 They believe the cyclical bull in place since March 2009 has topped out. If that’s the case then we should not make a higher high, and 1400 might again be a suitable limit before renewed and deeper declines. On the other hand, a golden cross (moving averages crossing) that just occurred on the SP500 suggests significant advances ahead to new highs. This is coupled with a death cross on the Vix also just happening – a twin occurence that previously gave way to strong gains for stocks. When I draw in my main references (solar and secular positioning), this is more aligned to my predictions – new highs in equities in H2 2012, before we consider any new cyclical bear market. Of course not all 3 chart predications can come good, but there is perhaps a little window here where they can unite in calling the index up towards around 1400 before they diverge. Lastly, here are (i) stocks and (ii) bonds as a percentage of household assets (US) with my channel lines added. 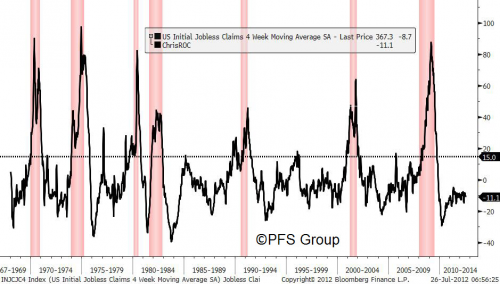 The message I suggest is that we are close to the end of the secular bear market in equities and the secular bull market in bonds or even beyond that point. He says that bull market generally have four quartiles, lasting around 410 days each. The biggest gains come in the first and fourth quartiles. He believes that from here stocks should make a siginificantly higher high accordingly in the fourth quartile which is soon to begin. Quartile 4: September 2012 – November 2013: again using the table average for the fourth quartile, the Sp500 would be around 2200 by November 2013 which would mark the end of the cyclical bull (NB: Birinyi comes up with an ending level of 2100, which cross references with my calcs). My take is that Nov 2013 is too far out, IF the solar maximum comes good in Spring 2013 (note Jan has been doing more solar work and estimates the solar max could occur Jan/Feb 2014). But as the calcs are based on averages clearly that could come in earlier but still generally fit with Laslo’s analysis. I have highlighted the first two quartiles below. Again, all the predictions in this post can’t all come good. It’s up to you to work out which are the red herrings.